Located on a central but quiet street of historical Sultanahmet, Hotel Ibrahim Pasha is a merging of two turn-of-the-20th-century Ottoman homes. Its rooftop terrace offers a beautiful view of the Blue Mosque and Marmara Sea, along with a bar in the service of the hotel’s guests. The rooms are decorated in a way that modernity and neo-classical style is blended. Airport transportation, daily city tours and private guided tours are provided upon request. The hotel is named after the neighbouring 16th century Ottoman palace (now the Turkish and Islamic Arts Museum) built by Ibrahim Pasha, the most popular Grand Vizier of Ottoman history. The Magnaura Palace Hotel is a newly opened boutique hotel in the Old City, within walking distance to the main attractions. 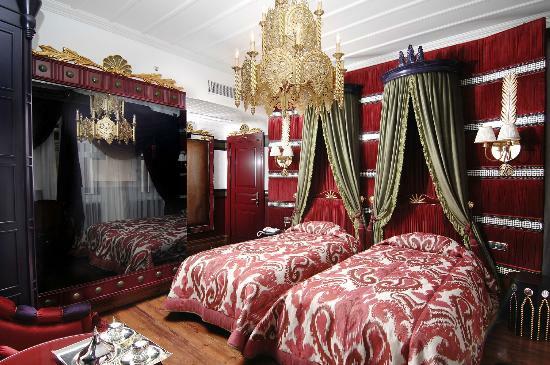 With its 18 rooms decorated in a traditional way, The Magnaura Palace also brings modern amenities into your service. Each room has a Juliet balcony, 9 of which facing Marmara Sea and the ruins of Magnaura palace. The hotel has a unique terrace view of the Blue mosque, St Sophie , Marmara Sea and Prince Islands along with the The Bosphorus Bridge. A continental breakfast is served in the morning. Daily city tours and private guided tours are also provided upon request. For the guests staying for 4 nights and more, one (1) way transfer from Ataturk Airport is for free. Owned and run by two American sisters, the Hotel Empress Zoe is located in the heart of the Old City. It is attached to the ruins of the oldest Turkish bath(hammam) in the city, built in 1483. Hotel Empress Zoe consists of several old Turkish style townhouses centered on a private archaeological garden. The hotel combines five separate houses, and rooms range from charming doubles with Byzantine or Anatolian-style murals, to a variety of garden and penthouse suites. With 25 rooms decorated in an orientalist style, the hotel has an authentic atmosphere. The terrace of the hotel offers a great view worth seeing and its garden is a gem with fountains, flower-studded domes and ivy-clad ruins of Isak Pasha Hamam. The lobby contains ancient walls and barrel vaulted passages which were once part of historic Byzantine and Ottoman Istanbul. Full of genuine antiques and artwork collected over many years, Kybele Hotel makes you feel like you are living old times. It is owned by three brothers, speaking 10 different languages. These three men decorated the hotel in their own way. With colorful lamps hanging from the ceilings and hand made carpets on the floors, this boutique hotel is like a small palace of a Sultan. Placed in the middle of the Old City, Kybele Hotel is within walking distance to the Blue Mosque, Hagia Sophia, Topkapi Palace, Hippodrome, Basilica Cistern, and the Grand Bazaar. The hotels serves tastes from the traditional Turkish cuisine in its restaurant. Upon request, special diet meals are also provided. Airport shuttle (surcharge) is among the services of the hotel. With its helpful and friendly staff and great location, Kybele Hotel seems like a good choice among vintage hotels around Sultanahmet. “If Istanbul had been properly preserved, what would we have today?” Armada Hotel claims that they have the answer to this question. Located at the heart of the historical peninsula, Armada Hotel has 108 vintage style rooms, decorated in the Ottoman style. In a 10-minute walking distance to the main attractions around Sultanahmet, this hotel serves luxury along with great service and staff. Armada Hotel has rooftop terrace restaurant with views of the Hagia Sophia, the Blue Mosque and the Sea of Marmara. The hotel has a rich buffet breakfast with homemade breads, jams, organic fruits and many other alternatives. After a tiring day, guests can enjoy their drinks at the Guest Lounge, which organizes a permanent display of 50’s and 60’s radios. The hotel has a vintage bus and offers rental boat service (Bosphorus tours) with a private yacht. For the ones seeking for an authentic Istanbul experience, Armada Hotel could be the best choice. Decorated in a classical fashion, Millenium Suites is like an oasis in the middle of the Old City. As a concept luxury boutique hotel, it has seven rooms adorned in a way to make you feel like home. The motto of this boutique hotel is as follows: “whatever religion you are from, whichever country you come from, whatever language you speak, you are ‘God’s Guest’ ”. The hotel provides daily sightseeing tours around Istanbul. Apart from open-buffet breakfast, its restaurant serves local and Italian specialties for lunch and dinner. Babysitting and airport shuttle services are also available upon request. Located in Sultanahmet, Hotel Amira is a luxury boutique hotel, in a walking distance to all the attractions. With its 35 specially-designed, modern Baroque style decorated rooms, this boutique hotel is offering professional service with its diverse amenities, such as a wellness center, a Finnish sauna and a wood-paneled hot tub. After a tiring day, you can relax in the "Complimentary 5 O'Clock Tea Buffet". Hotel Amira has the Travelers' Choice® 2013 Winner award of the website Tripadvisor. Babysitting, bicycle rental and airport shuttle services are provided upon request. As a means of enjoying your drinks and watching the sunset, its terrace is a perfect choice. 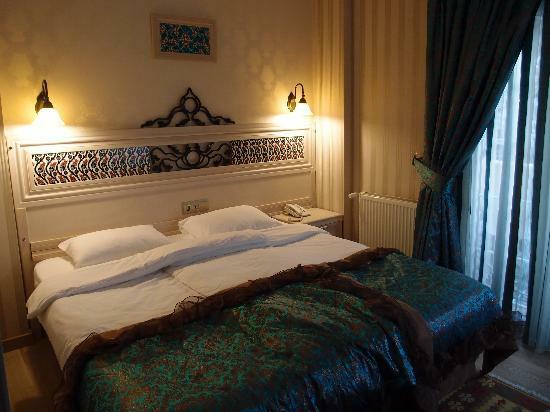 Owned and run by Mr. and Mrs. Okan, Hotel Sari Konak is only 150 yards from the Blue Mosque. This boutique hotel is like a modernised wooden Turkish house. As an old Ottoman mansion, the hotel was renovated in 1996. Classically furnished, Hotel Sari Konak offers an authentic atmosphere in the middle of the Old City. In the morning , you can have your breakfast in the courtyard outside where a fountain plays and an ancient Byzantine wall encloses you. Its terrace, where you can unwind, offers a great view of the Blue Mosque and Marmara Sea. The view from the terrace is much better in the evenings. Airport transportation is available upon request and if you stay 7 nights or more, the hotel pays your taxi fee. Daily city tours and private tourist guides are also provided upon request. Esans Hotel is a family-run, 19th-century wooden mansion hotel. It has Ottoman-style rooms with wooden furnishing and rich fabrics, named as old Turkish essences such as, Sultan Room, Harem Room etc. Just 120 meters (393 ft.) away from the main gate of the Topkapi Palace, Esans Hotel is located in the middle of the Old City. It is within a walking distance to the Blue Mosque, Hagia Sophia, Topkapi Palace, Hippodrome, Basilica Cistern, and the Grand Bazaar. Previously owned by a master perfumer in the Ottoman period, the wooden mansion was converted into a boutique hotel. If demanded, the hotel provides a special aroma/essence that the guests prefer for their rooms and baths. The hotel offers open buffet breakfast on its rooftop terrace with a unique view of the Hagia Sophia and Marmara Sea. Additionally, guests can make complimentary international phone calls to USA, Canada and some of the Europe countries.With its friendly staff, great service, and great location, Esans Hotel should be among your choices. Within walking distance to the landmarks of the city, White House Hotel Istanbul combines luxury with comfort. The hotel has 22 rooms, decorated in a vintage style. There is a restaurant, bar and lounge area inside the hotel. The hotel serves a non-alcoholic welcome drink and Turkish delights upon arrival. Guests staying at the hotel for 3 nights or more are entitled to free one-way transportation service from Ataturk Airport to the hotel (Sabiha Gokcen Airport is not included). Pets are also allowed in this hotel free of charge. The hotel has Travelers' Choice® 2013 Winner award of the website Tripadvisor. Great location, great service, great staff. In a walking distance to historical places around Sultanahmet (the Old City), Four Seasons Hotel Istanbul at Sultanahmet is a luxury hotel at the heart of Istanbul. Previously used as a neoclassical Turkish prison, almost a century-old, the hotel now offers sheer luxury and comfort for its guests from around the world. Listed in the 2013 Condé Nast Traveler Gold List of the world's best places to stay, Four Seasons Hotel Istanbul at Sultanahmet provides an unforgettable stay in Istanbul for families, couples or solos. You can find the same quality of Four Seasons hotels around the world. Airport Shuttle (surcharge) is also available. For families with kids, here is the good news: babysitting is provided inside the hotel. Including 65 luxury hotel rooms and suites, the hotel has some special suites with furnished balcony overlooking the Sea of Marmara. As for the pets, a special policy is valid, dogs only, and the maximum pet weight is 7 kg (15.4 pounds). Within walking distance to the main attractions around the Old City, Premist Hotel offers 24 standard and 9 deluxe,specifically designed rooms, each one having a special furniture. The color of red is dominant inside the hotel, which is boosting your energy. Fully marble furnished bathrooms give the guests the opportunity to experience traditional Turkish bath. Buffet breakfast is served daily and you can find many restaurants around the hotel as well. You can sip your Turkish coffee in its winter garden. Airport transfer and city tours are also provided upon request. As a family-run boutique hotel, Katelya Hotel is located on the Boukoleon Palace ruins, parts of which can still be seen in the breakfast room. Located in Sultanahmet within walking distance to the main attractions, the hotel combines traditional and modern styles in its rooms that are decorated in different fashions. Its rooftop terrace offers you a beautiful view of the Old City and the Marmara Sea. Babysitting, airport shuttle and special diet menu services are also available upon request. For the guests staying 3 or more nights, the hotel offers free one-way shuttle transfer to or from Ataturk Airport. 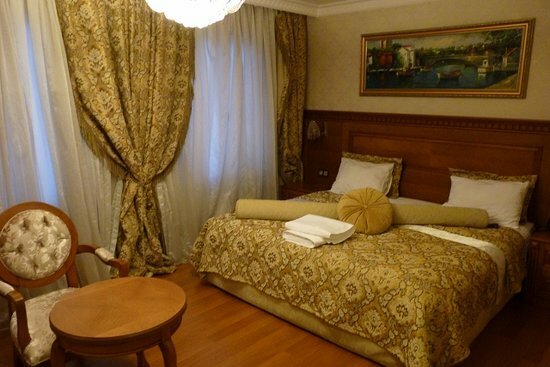 As a renovated Ottoman building, Biz Cevahir Hotel offers luxury with its meticulously furnished rooms. It has one room for the disabled people and upper rooms with terraced roofs overlooking the Blue Mosque and Marmara Sea. A rich breakfast, free tea service during the day and fresh apples every day are offered by the hotel. Babysitting, airport shuttle and city tour services are also provided upon request. Biz Cevahir Hotel has the award of Travelers' Choice® 2013 Winner given by the website Tripadvisor. As a family-run boutique hotel in the middle of the Old City, Hotel Seraglio has 14 rooms decorated in different categories. It has some rooms with specialities, such as the one having a hammam inside and the one with a terrace view of the Blue Mosque. It also has prints of works by famous Turkish painters on the walls of each room and an inner courtyard with a fountain. Hotel Seraglio has the award of Travelers' Choice® 2013 Winner given by the website Tripadvisor. Airport shuttle is provided upon request. 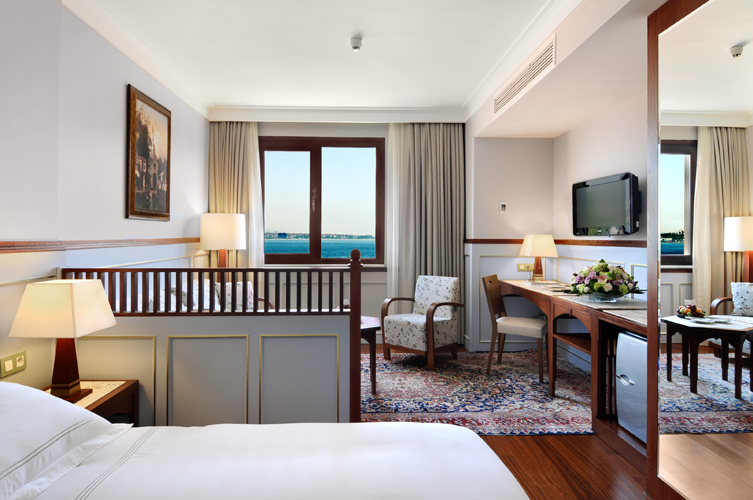 As its name suggests, Ottoman Hotel Imperial is designed in the Ottoman fashion, with a beautiful view of the Hagia Sophia and the Blue Mosque. The original building was constructed as an Ottoman school and hospital in the middle of 1800's. It was converted into a hotel in the beginning of 1900’s and renovated in 2005. The hotel has a terrace and a garden where you can unwind and take a sip from your drink. In the Matbah Restaurant of the hotel, you can enjoy the traditional Turkish cuisine across the view of Caferaga Medrese. Sadrazam Restaurant serves in buffet-style, while Saltanat Bar offers different drinks from different cuisines. If you book through the hotel’s own website to stay for 3 or more nights, the hotel provides one way free transfer from Ataturk Airport to the hotel. Babysitting and breakfast in the room services are also provided upon request. With its 11 spacious rooms having a special design with wooden floors and large windows, Hotel Djem is in a walking distance to the main attractions in Sultanahmet. You can see traditional Turkish fabrics everywhere inside the hotel. It offers a rich breakfast; for lunch and dinner, there are many restaurants around the hotel. Airport shuttle is also provided upon request. With its 18 rooms designed in the Ottoman and modern fashion, Hotel Novano is located only 150 metres (490 ft) from the Blue Mosque. The à la carte restaurant of the hotel serves tastes from the Turkish and international cuisines, as well as a breakfast buffet in the morning. Airport shuttle is provided upon request.